Technology For Musicians is another one of those brands that I’ve heard of but have never seen in person before. They’ve been mentioned a few times by customers, mainly for custom headless builds. They came up again at the London Guitar Show – I was chatting with Hobs (Stephen Hobson) from SBC Guitars about his next build (a headless, multi-scale) where he said he was considering using a Technology For Musicians bridge. (I had completely forgotten about them!) We discussed some other options but, as he hadn’t used one before, his thought was that he would like to give a Technology4Musicians bridge a try. 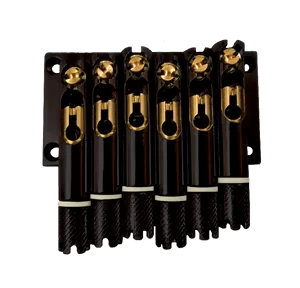 Technology For Musicians are an Italian manufacturer, offering a variety of bridges in both headless and standard configurations. Their designs are similar to the ABM Single Headless but use a bridge plate to mount the saddles together. Their bridges can all come in 6 string, 7 string, 8 string and more configurations! Here’s their Headless Bridges and their Standard Bridges. Scattered-Brain Concepts (SBC Guitars) are a custom guitar building duo, Stuart and Stephen, and are offering some really unique designs. You can follow their blog HERE – They are well worth checking out!